The squat, bench press, and deadlift may be among the most effective exercises for building muscle size and strength, but they can also take a toll on your body if your training program, technique, and recovery are not perfect. This article will give examples of small tweaks you can make to the big three lifts in order to keep your joints and tendons healthy. 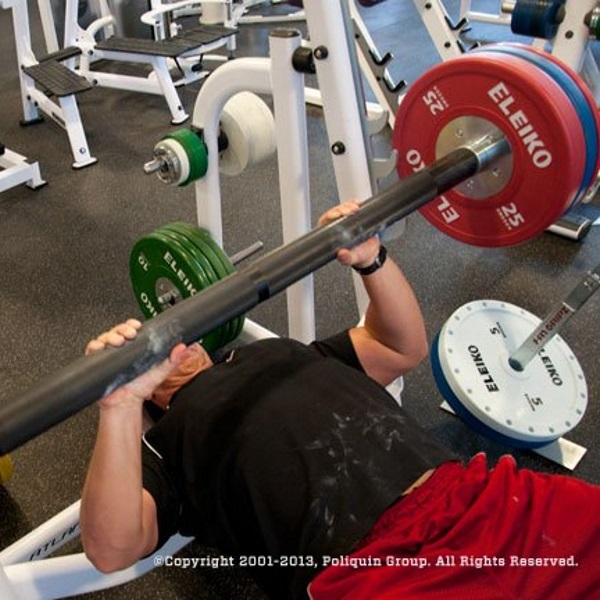 Bench Press: Use a fat bar or bar-thickening accessories like Fat Gripz to help center the bar in your hand, which will carry over into a neutral wrist and vertical forearm that will balance loading on the joint ends as well as demands on ligature and musculature. This can cause relief at the load site of the wrist and likewise relieve pain as it occurs throughout the arm muscles (particularly the elbow.) As an added result, the positioning will help you complete low-bar, competition style lifts that are generally a little easier on the shoulders, too. Wrist wraps can help as well, though the compression inherent in wraps can cause their own problems, as can the lack of balanced muscular action in the hand and forearm. Squat: While an ultra-wide grip is a go-to technique for many competitive lifters, it requires either a monolift or a narrow rack to maximize. Non-competitive lifters can achieve similar relief if they ditch the “elbows down” cue and instead let their elbows float back. Coupled with a thumbless grip, this relieves the entire arm and much of the shoulder girdle of the stress that comes with setting the bar. Bench Press Adjustment #1: Reduce your range of motion with boards, the Shoulder Saver Pad, and floor presses. This limits the degree of rotation experienced by the humeral heads and reduces irritation of stretch-sensitive pec and shoulder muscles. Bench Press Adjustment #2: The upper torso is a knotted maze of intertwined muscles and nerves where sometimes activating or inhibiting seemingly disconnected muscular groups can relieve joint discomfort. For example, anterior shoulder pain can sometimes be alleviated by repositioning the head by either lifting it from the bench or driving it into the bench. Bench Press and Squat: Arching can cause problems for folks who are “extension intolerant” by compressing nerves radiating from between spinal discs, so lessening or even eliminating arching can help keep tender backs happy. Reducing your bench ROM the same as you would for helping your shoulders can help offset the technique difference between arched and flat benching. For the squat, focus less on arching and more on tightening during your setup and reps. I like the “belly full of air,” “ribs down,” and Chris Duffin’s “pressurize” cues to help visualize this approach. Deadlift: Rounding of the back (particularly the lumbar area), as often happens during deadlifts, can cause problems for people who are “flexion intolerant.” If you’re in this category, use the ribs down/pressurize cue, and help yourself get into this position by using your lats to help pull yourself into the bar during your setup. All Lifts: Pack the neck (i.e., give yourself a double-chin) to activate your often under-used neck flexors during lifts. This can help acutely relax chronically overactive neck extensors (including the upper traps) that are often painful, and can be a part of a long-term approach to limiting neck pain if performed regularly during the day, such as while sitting at work or driving in the car. Squat and Deadlift Adjustment #1: Perpetually sitting back on squats and deadlifts can lead to knee pain, likely from a combination of quadriceps weakening and loss of stretch tolerance. The condition of “jumper’s knee” is essentially this phenomenon. An effective tool that can be part of reversing this pain (or on its own to head-off problems) is to break more at the knees during squats and deadlifts, which provides both a loading stimulus for the quads while also grooving a more aggressive movement pattern. If you’re worried about messing up your technique, use a knee-forward action/stance with dissimilar lifts such as Bulgarian squats, jumps, hack squats, Olympic lifts, and hex-bar deadlifts. Squat and Deadlifts Adjustment #2: Deepening your squat or deadlift can achieve the same results through the same mechanisms. Squat and Deadlift: The shape of your hip socket can limit how widely you set your stance in these lifts. Chronic anterior/lateral hip pain (generally centered over the joint) can be a sign that you’re pushing your stance too wide. After taking a break from wide-stance lifts, reevaluate the pain via narrow-stance (no wider than shoulder-width) work. Rows and Military Press: Instead of transitioning a rep when the bar touches your body, stop when your upper arms touch your lats. This prevents hyperextension of the shoulder joint during these lifts. If you feel like this motion is “incomplete,” an active focus on retracting the shoulder blades can help finish the lift without driving the elbows too far back. This also gives the upper-back muscles a boost and opens up the chest.